It was a hot Sunday afternoon in April 1997 when I stepped off a bus and crossed a highway in the outskirts of my hometown, Posadas, to become a journalist. I entered the newsroom at El Territorio, then the oldest and biggest paper in the province, to start an internship that was my first job in the industry. Although it now seems a momentous ocassion, I actually spent the afternoon sitting on a desk, looking at people work, after the assignment editor apologized for having no clue about what he was supposed to do with me. These were still Ye Old Tymes: it was on El Territorio‘s computers that I created my first email account and it was on its pages that I experienced the now old-style thrill of looking up your bylined story and re-reading every single word to then complain about the editor who’d destroyed your prose. 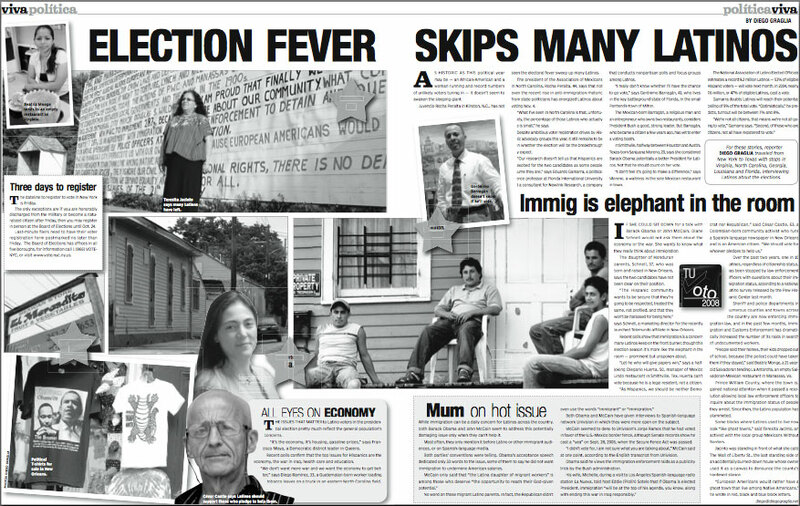 Coverage of the 2008 U.S. presidential election on the NY Daily News. After that start at a provincial newspaper with a circulation of about 15,000, I soon moved on to Buenos Aires and the national market. I covered crime stories for Clarín, the biggest newspaper in Argentina and then the one with the highest circulation in the Spanish-speaking world. After Columbia J-School, I learned the American style of newspaper journalism and a whole lot about Northern New Jersey, working as a beat reporter covering the post-industrial city of Elizabeth for The Star-Ledger of Newark. Later on, I became a steady contributor for the Daily News of New York, where I wrote features and spot news for Viva New York, a monthly section in the newspaper, and for Hora Hispana, a Spanish-language newsweekly. Here are some of my newspaper articles, from my first feature ever –a study of the relationship between teenagers and cops in Posadas– to New York arts and culture coverage for the Daily News and a story from the side of a railroad track in Mexico for The Star-Ledger. › Latino life, arts and culture for “New York’s hometown newspaper,” 2004-2008. › Work as a beat reporter in the leading newspaper in New Jersey, 2003-2004. › A newsweekly in Spanish published by the Daily News (NY), 2004-2008. › The crime beat and other stories in Buenos Aires, 1998-1999. › Stories as a New York correspondent for Texas newspapers, 2006. › My first job ever as a journalist, in Posadas, Argentina, 1997-2000.